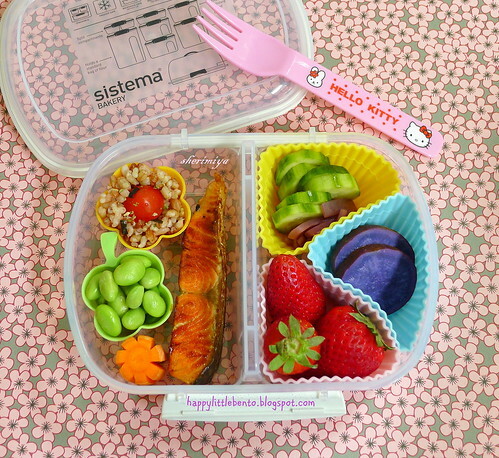 Little Sistema Salmon Bento, a photo by sherimiya ♥ on Flickr. Happy April! I can hardly believe it's the 1st of April already. Next month we'll be done with school. Summer is almost here!! Okay, let's calm ourselves down a bit. There are still quite a few more bento to go before we get to take a summer break, and let's start with this one for TinySprite in our Sistema Bakery Box. It's a good Monday bento which required very little prep since the day before was spent running around, searching for eggs, and enjoying the springy Easter weather without a thought for the next day. I had some wild salmon in the freezer, which took only a few minutes to cook in butter and shoyu, to be packed with a cute floral cup of red rice and furikake, another cup of edamame, a fresh stash of pickled veggies, more Moloka'i Okinawan sweet potatoes, and the sweetest EVER organic farmers market strawberries. They are smallish in size and oddly shaped, but the flavor burst when you bite into them will bring tears to your eyes. The vendor actually guarantees you'll be back for his berries because they're the best. He's quite the salesman, but he's right. I'm definitely going back next week. Hope you all had a wonderful weekend! Oh no - there'll be no lunch box posts over your summer holidays? I was sick for a few days but during that time have really enjoyed viewing your bentos! It's like looking through a beautiful book. You've also inspired me to make more of an effort to eat better. It's so well-designed and practical, isn't it? I'd get them in a whole bunch of sizes, if they were available. Thanks Jasi! Teriyaki salmon is a kid-pleaser! Mmm... this makes me crave strawberries (still way too cold for that here!) I love the simplicity of this one.. so much natural colour too! I'm so happy these strawberries are available so early; they're about the only fruit that's getting me through this cool spring. Thanks Megg! Love these bentos! I was wondering how you keep these from going bad throughout the school day. Are they stored at room temperature all day and OK for the kids to eat at lunchtime? Or are they kept refrigerated all day then the teacher warms the bento up for your kids? These bento are meant to be eaten at room temp. They are taken to school cold, and warm up to room temp by lunchtime. If it is a hot day, then I'll send an ice pack as well. I live in San Leandro, so I get mine at the local market here. But you can find them all over the bay area right now! Getting them straight from the farmer ensures that they weren't stored in the refrigerator so they are at peak ripeness. The vendor told me to keep them covered with paper towels to prevent condensation, and don't wash until right before you eat them.